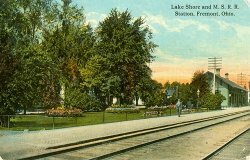 Welcome to Sandusky County Ohio Genealogy and History! May Your Dreams of Catching Your Ancestors Be Realized by Entering the Land "at the cold water"! Sandusky County, Ohio! This page is part of the site located here. There is no charge to access this site's pages. If you have arrived here from somewhere else, such as a pay site, and are in a frame, you can click the correct url of this page to break free of the frame. Our names are Maggie Stewart, and Bonnie Walsh. We will be your hosts while you are here! We hope to make your visit a pleasurable one. We do not live in Sandusky County, but will try our best to make this an informative and useful site, and hope that you will return often. Sandusky County is located in the north western section of the state of Ohio. It is bounded by: Ottawa county and Lake Erie to the North; Erie County to the North East and East; Huron County to the East and South East; and Seneca County to the South; with Wood County to the West. Fremont the county seat: FREMONT, a city in northern Ohio, the seat of Sandusky Co., situated on the Sandusky River, 30 miles southeast of Toledo and 80 miles southwest of Cleveland. The city is primarily an industrial community, located in a farming area. Known as Lower Sandusky, the name changed to Fremont in 1849 in honor of General John C. Fremont, who had justed blazed a trail to California. Fremont was incorporated as a city in 1867 and has the major-council form of government. During the War of 1812 Fort Stephenson, which was located nearby, was the scene of a memorable engagement. The outnumbered garrison force under Major George Croghan routed an attacking force of British and Indians in 1813 with the aid of a single six-pound field piece. Croghan is buried in Fort Stephenson Park, in the heart of Fremont's present business district. Spiegel Grove Park was once the home of President Rutherford B. Hayes. The Bowling Green State university has a branch campus in Fremont. The principal products of Fremont include sugar, processed meats, batteries, electric switches, cutlery, and rubber goods. Population in 1970, 18,490. Fremont, Sandusky County, Ohio by Bonnie Walsh. Webmaster of Sandusky County, Ohio GenWeb Homepage.